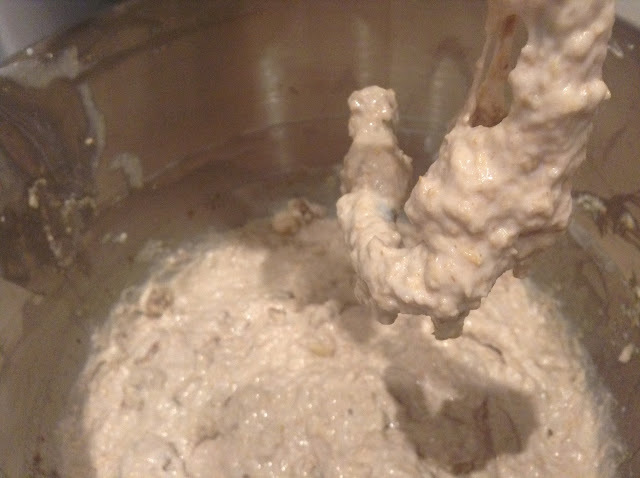 For most of the way through the baking of the 100% (-5%) Whole Wheat Walnut Bread it looked like I was making a (rather unappetising) porridge. This week's project for the Alpha Bakers is pretty easy to make as long as you can keep your nerve. I'm not sure if my dough mixture was too wet - it's possible given all flours are a bit different, but I don't have the experience to judge this myself. I baked on regardless, with only my faith in Rose's recipe to keep me hopeful. It seemed to turn out all right as you can see by the picture below. It is certainly solid (I can see why fellow Alpha Baker Faithy referred to her bread as a doorstopper) and the texture is fairly dense. However cut into thin slices it has a nutty, slightly sweet flavour, and spread with Blue Castello cheese and mango jam (the bomboniere from a wedding I went to recently) it was delicious. Because I had to leave the bread to cool overnight and took the photo before I went to work this morning; this was breakfast. Oh yum. You might have noticed that my bread is only 95% whole wheat rather than 100%. This is for two reasons - 1. I was a bit doubtful about the heaviness of all wholemeal flour, and 2. I didn't want to buy vital wheat gluten (which apparently provides some lightness) because I HAVE NO MORE STORAGE ROOM IN MY FRIDGE AND/OR FREEZER, plus I didn't know if I would ever use it again. So I asked my friend google who suggested 5% would be a good amount of white bread flour to provide the desired lightening effect. Although when I went back to look at the article (after I'd made the bread) what it actually said was a ratio of 1:5, white to wholemeal flour - so much for my memory. Well it seemed to work out although I didn't make any other adjustments, i.e. to liquids etc, because I really have no idea. I'm sure some of the more expert Alpha Bakers would be able to advise on necessary adjustments. The other thing I was confused about with this recipe is the bread flour versus plain flour. 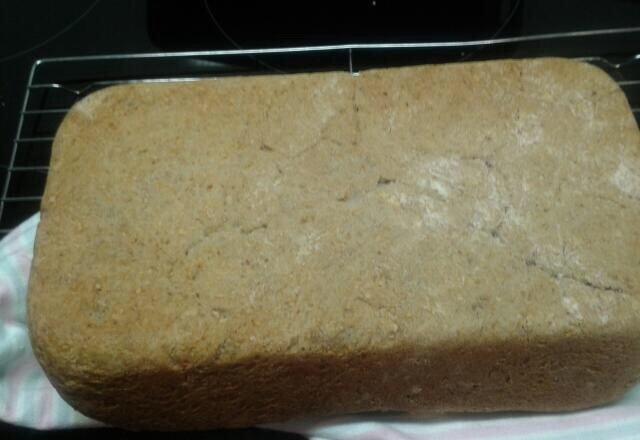 I couldn't find much advice on whether the wholemeal flour should be strong (bread) flour. In the end I used the wholemeal flour I had in the freezer (yay more room) which was just ordinary plain flour. Since then I've seen reference to strong wholemeal flour in a couple of recipes online but haven't seen it to buy in the shops. So that question's still not resolved. 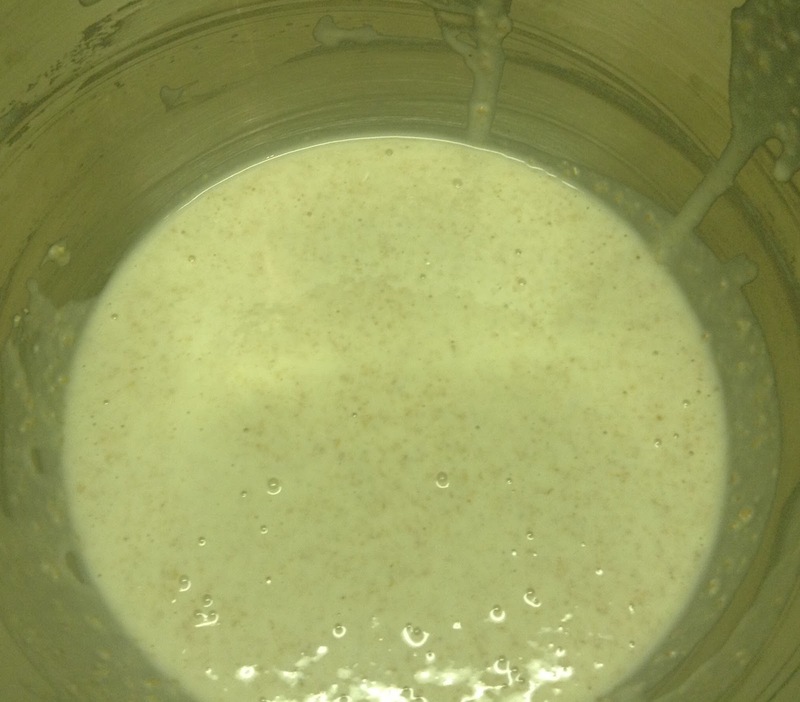 The bread starts with a starter, logically, which was extremely liquid as you can see. 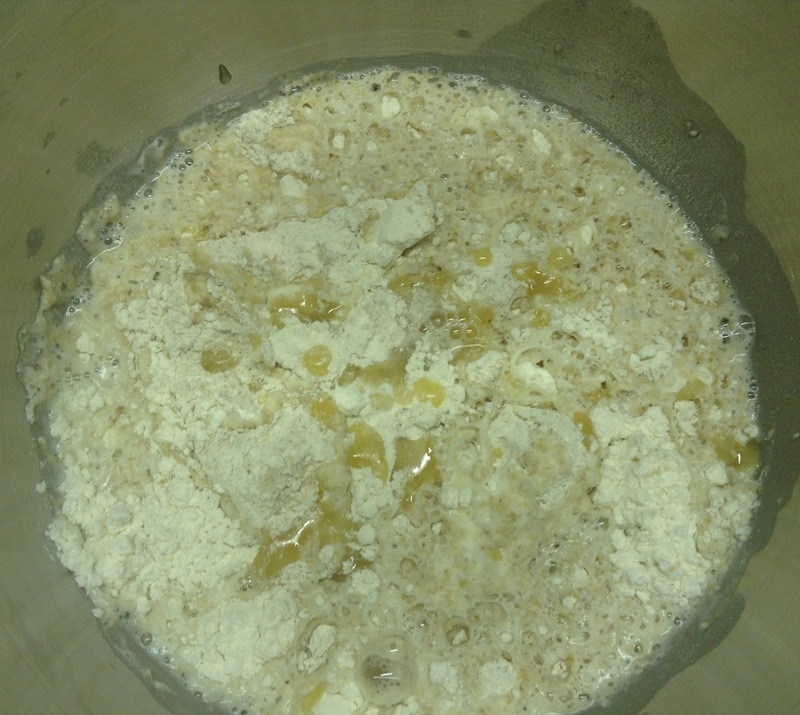 It has the two flours, honey, water and yeast. Once it is mixed, the flour for the main bread dough is sprinkled over the top and it is left to ferment. 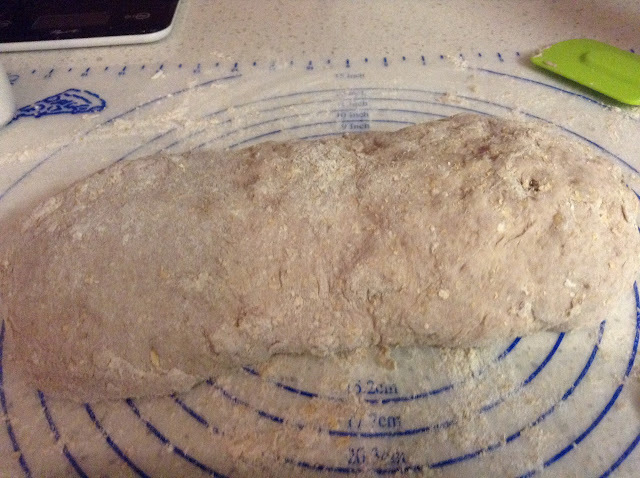 You'll have to excuse the wild variation in colouring on the photos for this bread since they were taken at different times during the day and night and on different gadgets. 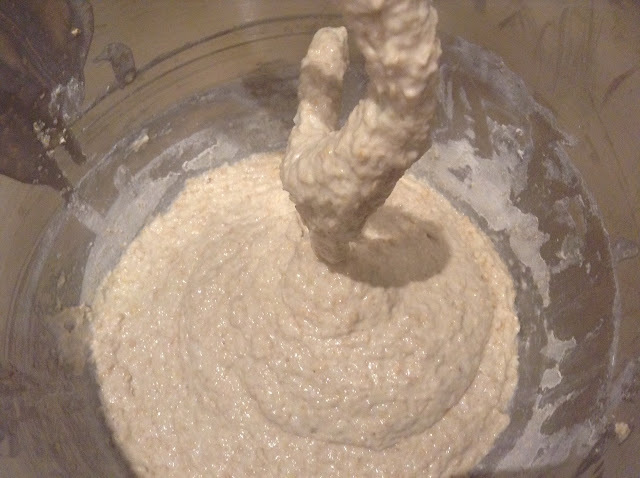 Once the starter has broken through the flour you mix it for a while. The dough is left to rise for a while and then tipped out for a four-sided fold. 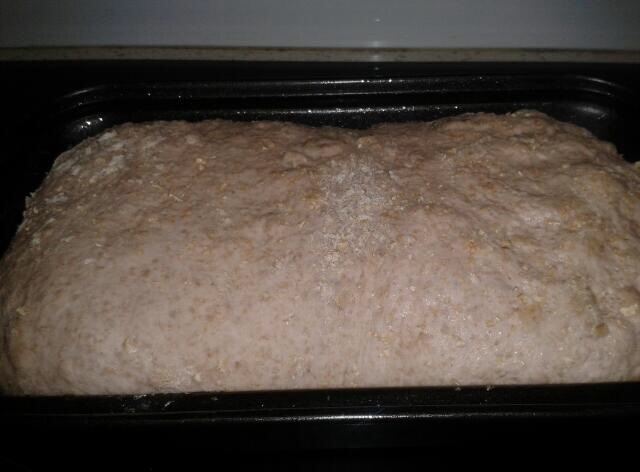 Not looking very bread-like or conducive to being folded in any way let alone four ways. 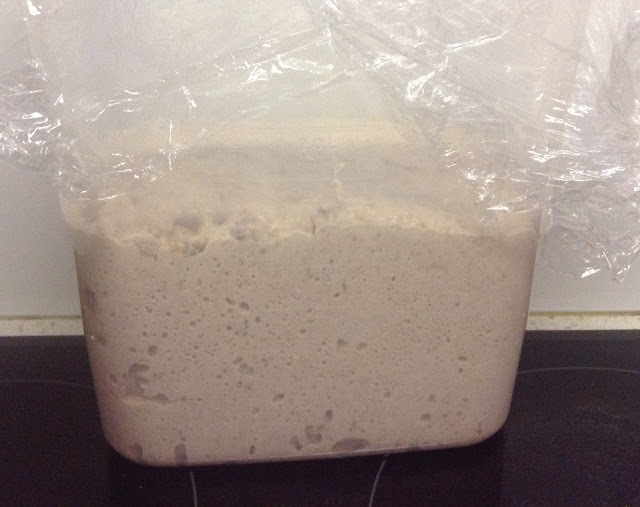 A bit of flour and a lot of sticky persuasion and it was 'folded' and placed back in the plastic container to rise. 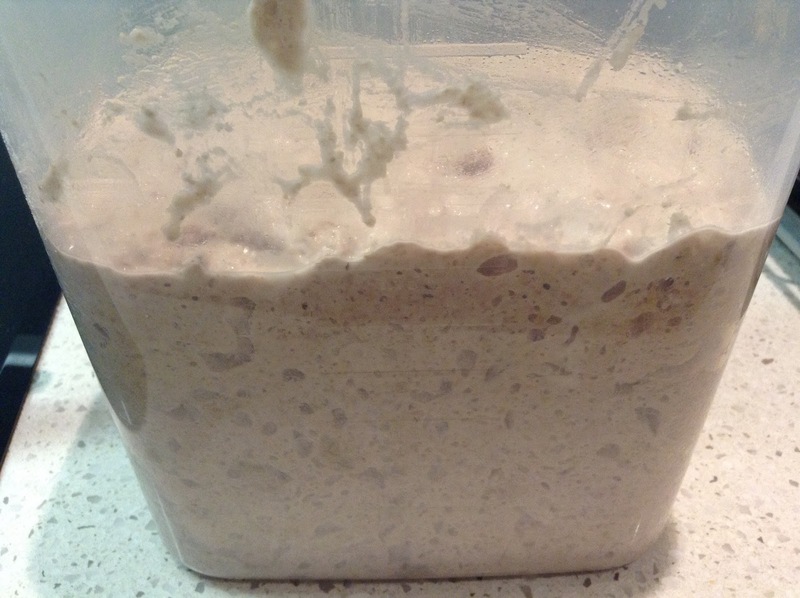 I had to put the dough in the fridge overnight and it had risen quite a bit by the time I came to retrieve it the next evening. It was quite holey and smelt yeasty so I assumed something bread-ish was happening. 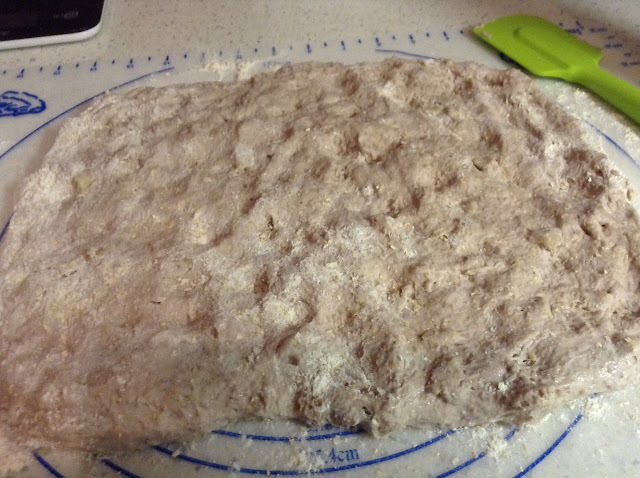 When flipped onto the bench, it still didn't look a lot like your run-of-the-mill bread dough and needed quite a bit of flour to persuade it into a rectangle. Is this the latest photo of the surface of Pluto? My bread tin was approximately the right size but the dough didn't fill it as it should have according to the recipe. I wondered if putting it in the fridge overnight was the reason it wasn't as puffy as it should be. I didn't want to leave it to rest for too long in case it made the bread over proofed and too yeasty. I left it to rise and it did dome over the top of the tin after an hour so I thought it was all right. Forty-five minutes in the oven and it came out looking golden, if slightly wonky. The bottom showing remnants of the 'sausage' stage. 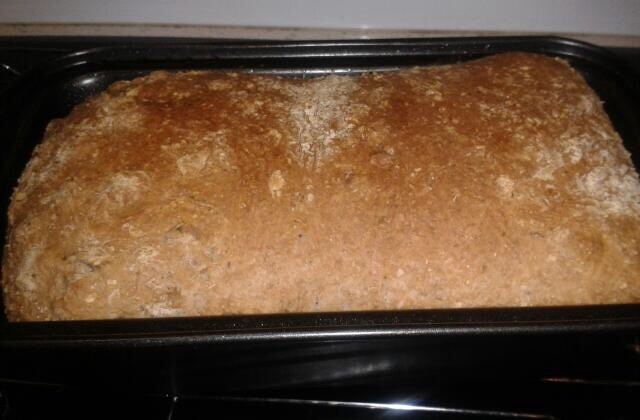 The crust was very hard when I took it out of the oven but after cooling it became a lot softer. 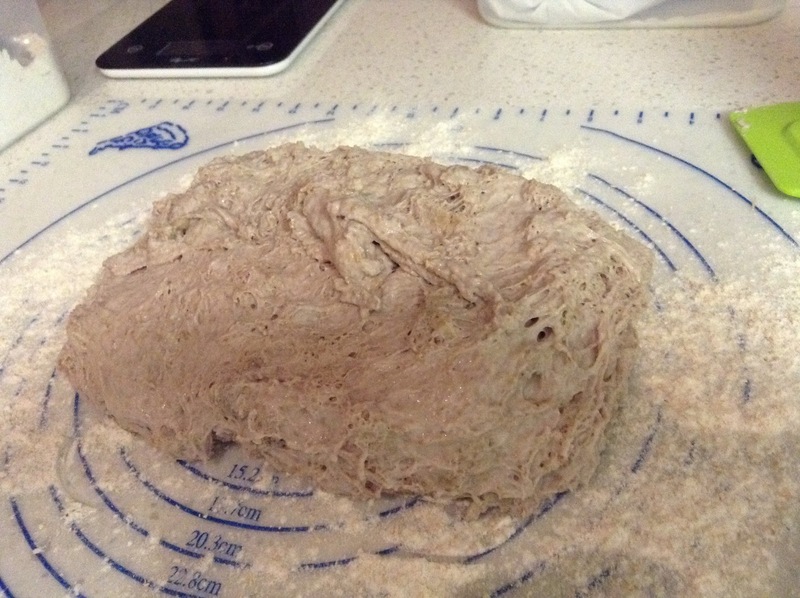 In the end, the wet dough wasn't a problem and it didn't taste too salty or too yeasty. 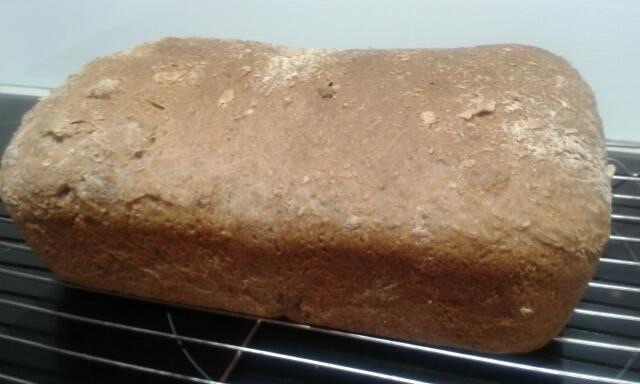 I'm not sure if it was dumb luck or exactly as it was designed to be (95% wholemeal, 5% neuroses), but everything seemed to work out with this bread. Next week is a catch up week and I'm thinking I might try the Red Velvet Rose since I missed out on that a few weeks ago. Very nice looking loaf of bread you turned out! 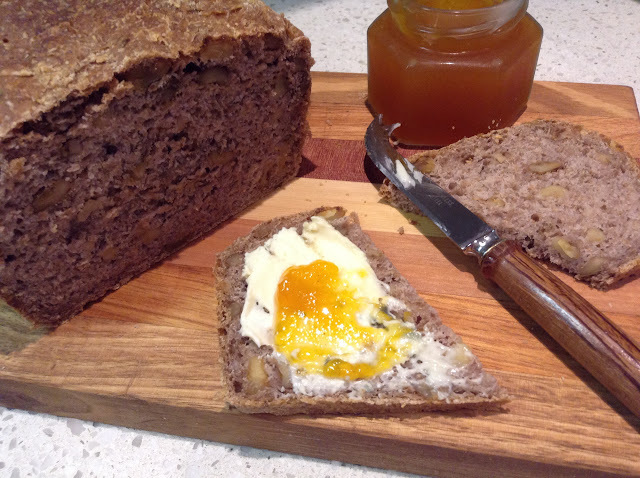 Mango jam sounds perfect with this nutty bread. Wish I had thought to google the gluten factor, paid almost eight dollars for a small bag and it's now crammed into my freezer. It's getting quite comical trying to stuff all my flours in there, along with all the other baking leftover bits. 5% neuroses, lol! Your bread looks just perfect, and mango jam sounds so delicious. Your bread looks perfect! Mango jams sounds wonderful even though I'm not a jam person.. 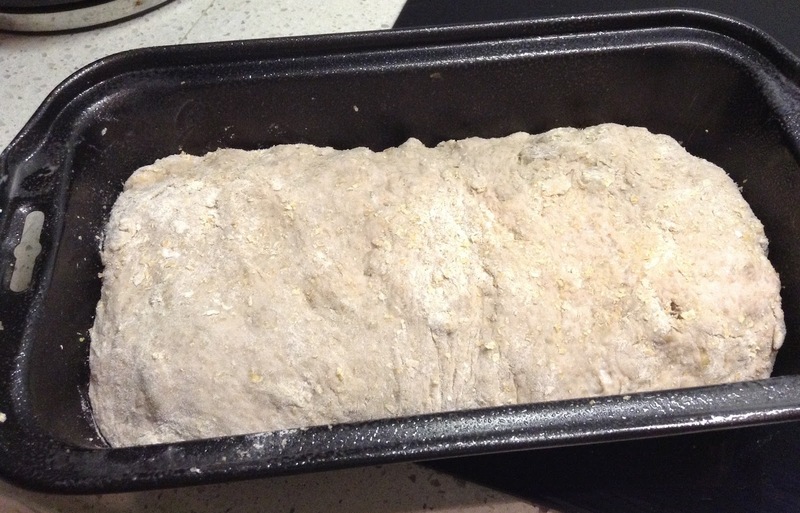 Your bread looked great even after adding 5% neuroses! 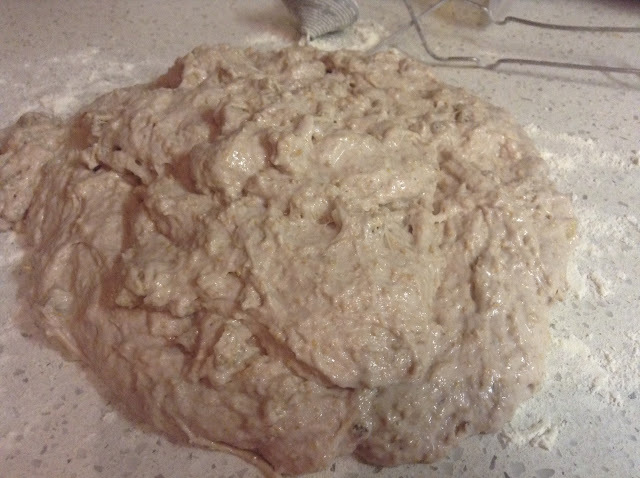 My dough was as unmanageable as yours. Castello cheese on toast, now, that's a good breakfast!